Click on region from which you want help or click on links below. Height and Width of core intersection. Button for adding wanted voltage to list. List of selected input voltage. List of calculated input amperage. Add/Change button for adding/changing wanted voltage and amperage to/in lists. List of wanted output voltage. List of wanted output amperage. Check box option in list. Input and output number of coils. 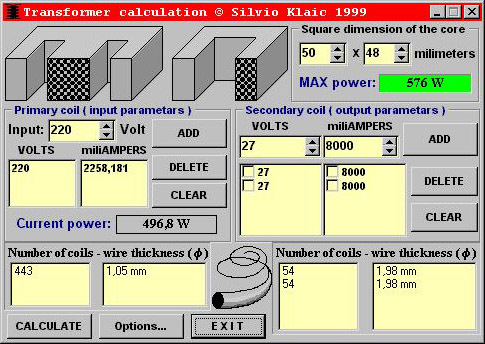 Input and output wire thickness.